Renovation Of Chihil Sutun Palace Completed 2018-08-22 | Ismaili.NET - Heritage F.I.E.L.D. Wok on renovation of Chihil Sutun Palace – meaning Forty Columns in English – a cultural heritage from the 19th century, has been completed. The palace was built by Abdur Rahman Khan who was Emir of Afghanistan from 1880 to 1901. 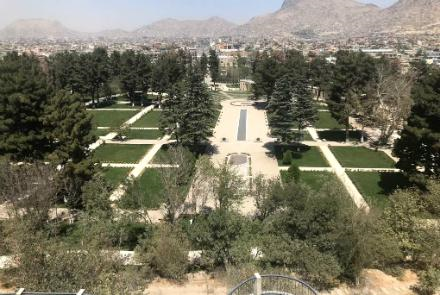 The palace, that includes a garden and a pavilion, is lying over 60 acres of land in Kabul’s Chihil Sutun area in PD7. It is expected to attract thousands of visitors from Kabul and other provinces of the country. The project has been financed by the German government and has been implemented by Aga Khan Development Network which works on renovation of historical and cultural places in the country. The project has taken three and half a years. The historical site is registered as a cultural heritage at the Afghan Ministry of Information and Culture. The palace was used as a guesthouse for foreign delegates before the civil war in 1990s. Almost 50 percent of the palace was badly damaged during the past decades of conflicts in Afghanistan. “During (former president of Afghanistan) Daud Khan, foreign delegates were welcomed here in this palace. They were holding their official meetings here,” said Assadullah, a resident of Kabul. A gymnasium, exhibition hall, sports grounds and several stalls and shops have also been established in different parts of the garden to facilitate the visitors. “When I saw this palace, all items used on it including the dishes were from bronze. It was functional during the last days of (former Afghan president) Dr. Najibullah,” said Imran Khan, former head of the National Museum. Officials say they hope that thousands of people will visit the Chihil Sutun Palace once it is inaugurated to visitors.